This is Phone.com old review. Click here for the new and updated review! Phone.com is a virtual phone service with three product offerings, Business, Virtual Business, Residential, and Mobile Devices. Each of these services targets a particular business or home use and can be tailored to the individuals requirements via two pricing bands a pay per minute or an unlimited calls package. These plans are flexible and you can combine them so that some extensions could be pay per minute and others on the unlimited plan dependent on the projected call usage. We will revisit the call pricing later for just now we will take a look at what the individual services offer and how they differentiate from each other and their competitors. 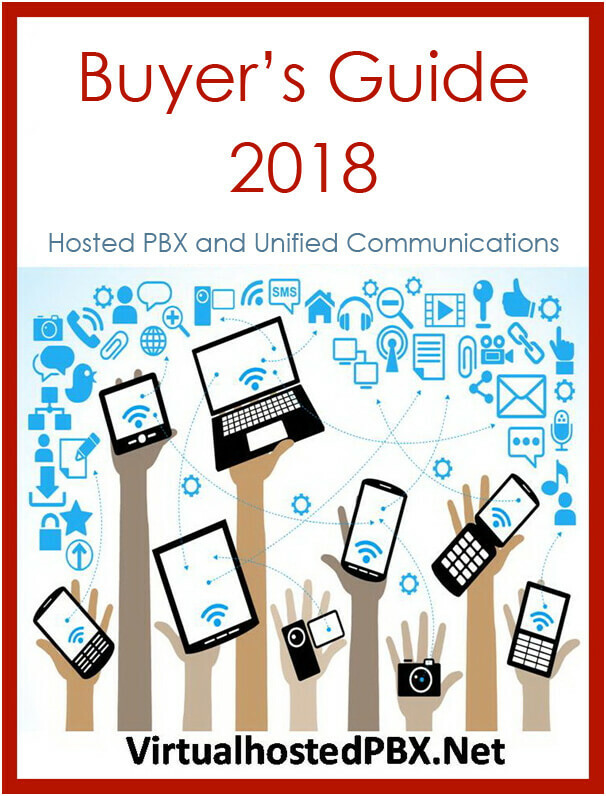 The virtual phone service market is becoming a very competitive marketplace with many good products now providing reliable, high availability and high performance service due to their cloud based technology. Phone.com then has some tough competition in providing virtual phone services for the small medium business market sector. Phone.com business model is to provide an internet virtual phone system that will handle all the business telephone requirements for a small to medium business. However in order to be able to compete in this market their service must have not only core features but also something that differentiates it from the competition. The essential feature in any virtual phone system is the business number that comes supplied and there should be a wide variety of options whether that is toll free, vanity or using your existing real number. Phone.com certainly meet the requirements here as you can add a local US number, global, toll free and vanity toll free numbers or transfer your existing number to your account through the manage phone numbers. A quick explanation though a global number is a number that you can choose from one of dozens of countries this is very useful if you visit that country a lot as it will mean you will pay local charges when there. To transfer an existing number requires that you complete a Letter of Authorization and copies of bills this is necessary to transfer the number from the telephone company to Phone.com this can take up to 60 days. So be aware that if you have an existing business number it isn’t going to be an overnight process changing over to phone.com. However, you could get your Telco to forward calls to the one free toll number the phone.com supplies with the service. Other toll free numbers can be supplied to your company by Phone.com at an addition price. With the Business service, you can add Unlimited Users. Now this is a bit ambiguous because an Unlimited User is actually a type of user. It is a person in the business account that has the unlimited monthly calling minute’s price plan. These unlimited calls made by the Unlimited User will not be billed to the account if they were made within the US, Canada, France, Germany, Italy, Netherlands and the United Kingdom. 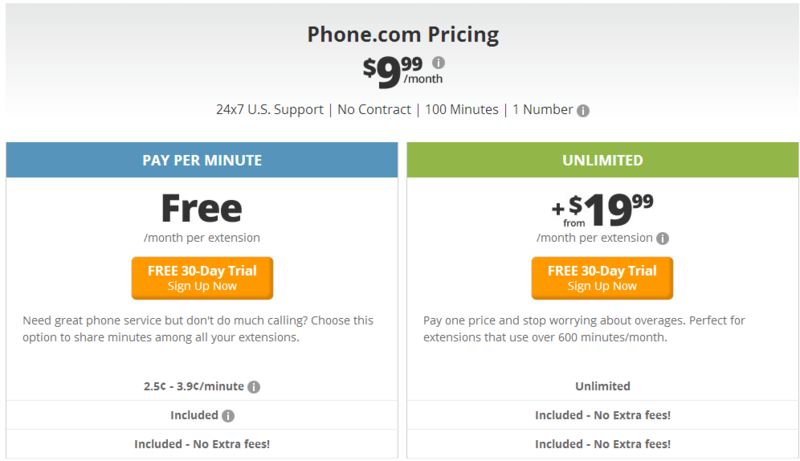 Another distinction is that an Unlimited User can use a virtual extension or an IP phone and Phone.com will not charge the additional $4.99 monthly extension fee. This is where the phone.com service becomes confusing and unwieldy for except small companies. For you see there are differentiations between regular users and Unlimited Users and pay per call users. You can start the service with just a single Unlimited User and the other regular users can share the monthly pool of minutes. Additionally a regular user can be upgraded to an Unlimited User instantly however there is a monthly fee that will apply when adding Unlimited Users. Although this may provide granularity and cost saving for the small cost conscious company, where accountants time is not an issue but it would prove unnecessarily complicated for a medium or large company to administer and reconcile. The Phone.com system is very similar to other inbound virtual phone systems in that it acts as a call answering and forwarding service. This is the standard model used by Grasshopper and RingCentral to name two. In case you are not familiar, the Toll free number that Phone.com supplies will be the business number advertised to clients and on marketing collateral. Customers will call this number and the Phone.com virtual answering service will answer the call and provide a greeting service. You can customize this service for client if you wish. The client is offered a menu of options or they can select a name from a directory service by entering in the first or last name. Upon making their selection, the call is then forwarded to a preconfigured number for example a mobile phone, a home extension, or a landline number. This is the standard operational model for most virtual phone systems for handling incoming calls. The Business product permits you to have as many extensions as you wish one for every employee each with its own username and password for them to login to manage their extension settings and access their inbox for voicemail. The advanced voicemail delivers messages to a phone, email inbox or as a text message. You can choose to listen to voicemail messages over the phone or have them delivered to your inbox as .mp3 files. Other features of note are the auto greetings for incoming calls. The greetings can be recorded and uploaded, as can the hold music or you can choose from a selection of prerecorded hold music. Conference calls are supported for HD audio – no video – and are compatible with any phone system. The conference bridge can support up to 500 participants – not that you are ever likely to manage 1/10 of that – and as moderator, you have full control of the call. One drawback here is that Phone.cpm assigns a permanent conference bridge number that cannot be changed. This is quite a useful feature but Phone.com has deemed it to be worth an extra monthly fee. This is unfortunate because it would be a good feature for a system administrator to have. Most of this is standard reporting, which should be part of the base system not charged as an addition fee. The actual analytics which they could claim aren’t standard administrative reporting just aren’t worth it because of the online management. The online management allows administrative access to manage usage, billing features, and individual extension settings as well as to add premium services and upgrades. The Phone.com Business service comes with over 40 odd incoming calling features, unfortunately those that are of any use they have provided as upgrades, such as call recording, hold music, voicemail transcription and strangely the communicator Softphone. By providing the Softphone as a paid for upgrade they have had to obscure the SIP address and phone settings – they refuse to divulge them – so that you cannot even download and configure your own favorite SIP Softphone. The Virtual system is similar to the Business service in so much as you can select a phone number to use as the virtual services main business number. This is the number that you will advertise. Again Phone.com acts on your behalf to auto-answer and acts as a answering- assistant to greet customers and provide them with a professional answering service for your incoming calls. There is no need with Virtual to provide IVR menu’s as it is simply performing a call forwarding service. This seems to be the primary difference between Virtual Business and Business is that the former is designed for a single user whereas the latter is for multiple users. The only difference between Virtual Business and Business as far as functionality goes is that Virtual does not come with the HD conferencing service. However, it has all the other features either free or paid for such as the add-ons and upgrades such as call recording, advanced voicemail, advanced call routing, and the forty odd standard incoming call features. However being a single person service there is no option available for the analytics module though there still is the online administration portal, which is where you can configure and access your online account. Similarly for whatever reason the communicator Softphone is a paid for optional extra. With the residential system, a user will choose to port their existing number, which I would have thought the most likely, or choose a local area code to be assigned as the phone number that Phone.com will manage. Phone.com sends the residential customer a ‘Free’ phone adapter, which will allow you to connect your existing home phone to the internet. For this service, you will need a high-speed internet connection. That is really all that is involved as you now have a ready to use residential service. As with the Business and Virtual Business service the residential service gets advanced voicemail and the standard incoming phone service features such as call hold, call transfer, call waiting and caller ID. There is also advanced call routing and you can customize your own custom call greetings. The online administration portal is there, however, there are no upgrades or add-ons, conferencing, analytics, Softphone options or mobile phone options. The residential offering has been stripped of most of the business features offered with Virtual and Business, which seems logical enough until you see that the pricing plans are identical for all three. However, we will come back to this later. For now, let’s consider the last of the products the Mobile device service. Mobile Office is Phone.com’s smart phone application where it can be used to access manage and become your business extension. 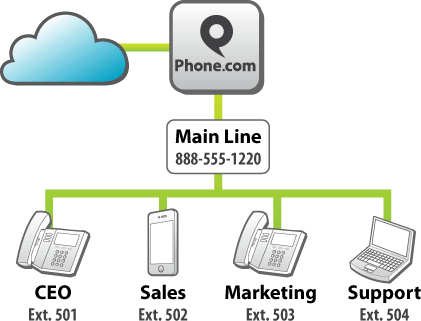 The inbound service is similar to Grasshopper and RingCentral whereby Phone.com provides an inbound answering service and redirects the call from the Phone.com Toll number to the customer’s mobile phone. This happens seamlessly to the caller who believes he is having his call handled by an enterprise class PBX. The inbound service has caller ID recognition and rules can be applied to filter of handle calls before they are actually answered. The customer can then decide whether to reject, sent to voicemail or answer. Furthermore, with Mobile Office you can call outbound and receive inbound calls from your Phone.com business number. Listen to, or receive voicemail, faxes, and send and receive SMS. The standout feature here is the way that Phone.com handles outbound calls. Most virtual phone systems cannot handle outbound calls well as they are purely incoming call services and do not provide a dial tone. 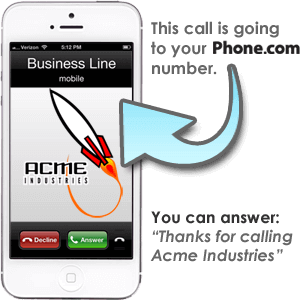 With the Phone.com application you can place outbound calls using your Phone.com business number as the caller ID. How Phone.com handles this is by getting the user to place the call through Voicemail administration. A Mobile Office subscriber can place on outbound call simply by dialing the Phone.com Business number and login in to their Voicemail. From there the user can place an outbound call that will have the Phone.com business number as the caller ID. This is a really good way to handle this and has been a bit problematic for Phone.com’s competitors. This is the best way that I have seen this handled and is a huge improvement on some of the competitor’s attempts. Phone.com is a virtual phone system that has four products Business, Virtual Business, Residential and Mobile Office. Apart from Mobile Office, none of these products particularly stands out. There is nothing wrong with them and they are perfectly capable they just aren’t particularly innovative. Unfortunately, where Business and Virtual Business do stand out is by making features and function typical given for free by their competitors as paid for options. The standout is there reluctance to allow you to use your own Softphone and their decision to make the reporting and analytics module another paid for option. Neither of these modules is good enough to warrant an additional monthly fee. Speaking of fees all these services are priced at the same rate with the same service plans. I would think that makes Phone.com best suited to SoHo (Small office/home office) or an SMB (small-medium business) due to the flexibility and the unlimited service plans on offer. However, where Phone.com does stand out is for its mobile application Mobile Office this is a paid for option with both Business and Virtual so can be readily integrated into those services and it does also stand alone as a separate product, which would make it a good service for a sole entrepreneur. Its ability to handle both incoming and outgoing calls is a major achievement and is the single outstanding feature in another wise competent but uninspiring virtual phone service for small business.